The Eyed Hawkmoth is one of the most commonly recorded Hawkmoths throughout much of the British Isles, becoming scarcer in northern regions. It’s also well distributed throughout much of Europe. In the British Isles it flies at night in a single generation between May and early August when it is attracted to light. 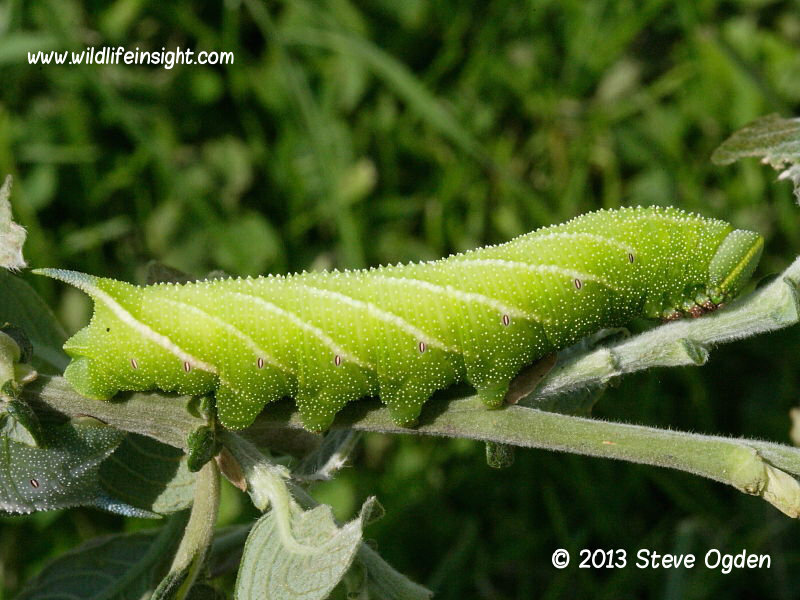 The Eyed Hawkmoth is most common in habitats containing the larval foodplants of sallows and willows but the caterpillars are also frequently recorded feeding on varieties of apple tree found in gardens. 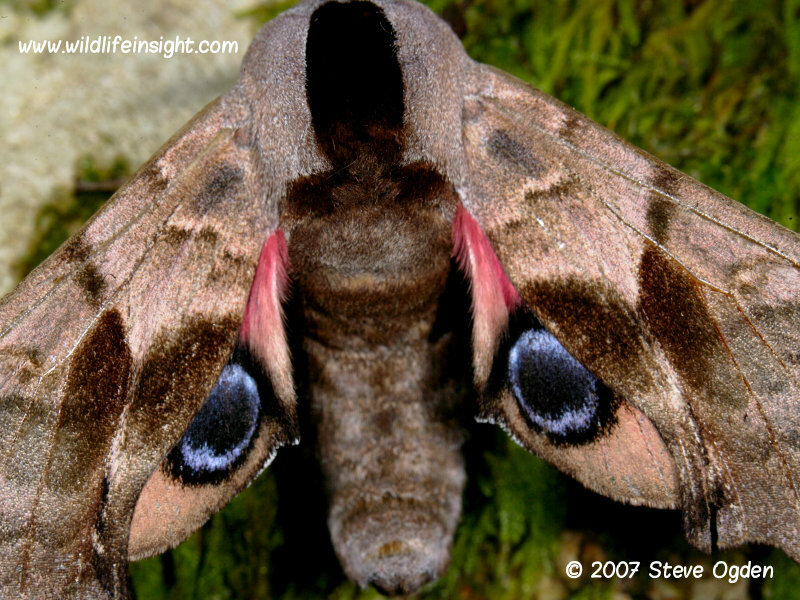 The adult moth has a wingspan of up to 100mm with females being on average larger than males. When disturbed it exposes its hindwings revealing a dark ‘eye’ marking outlined in blue. The ‘eye’ markings and thick black line extending down the thorax behind the head make it an easily identified Hawkmoth. 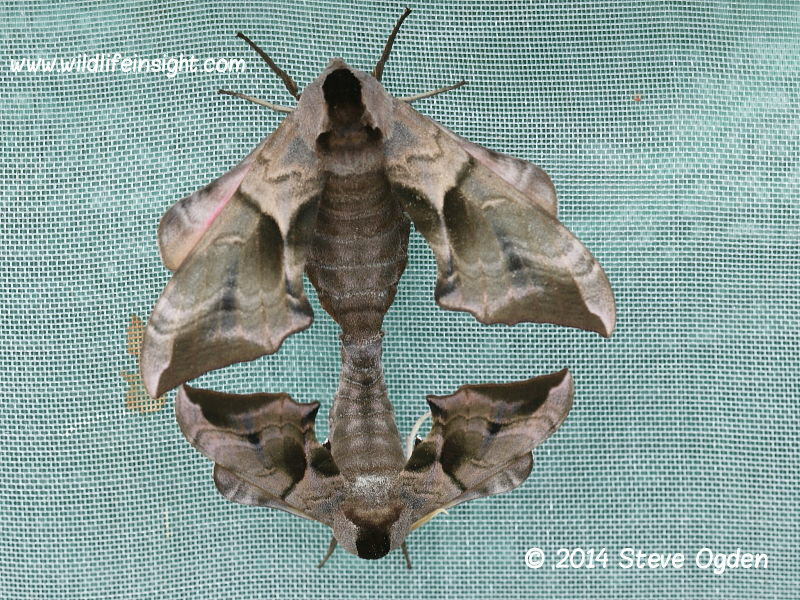 Other common European Hawkmoths include the Poplar Hawkmoth, Privet Hawkmoth and Lime Hawkmoth. 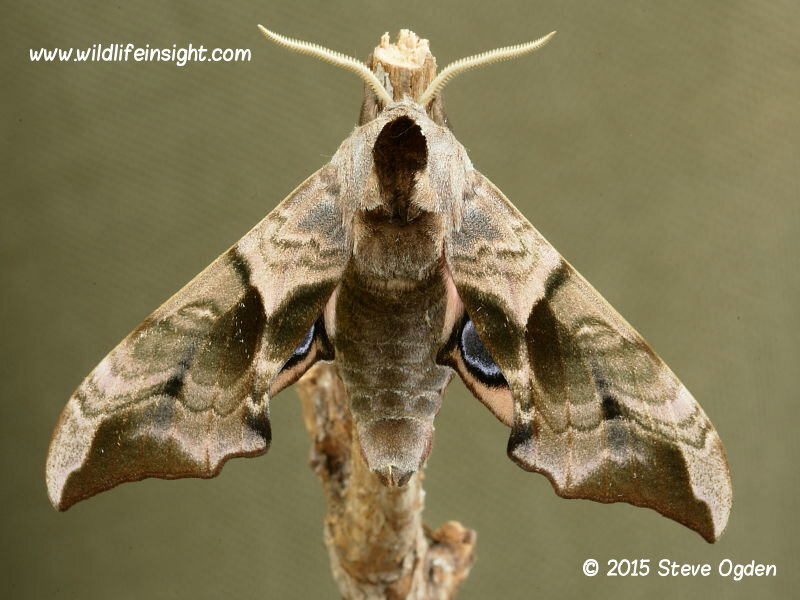 Other Hawkmoths can be seen in the moth gallery or on species pages. 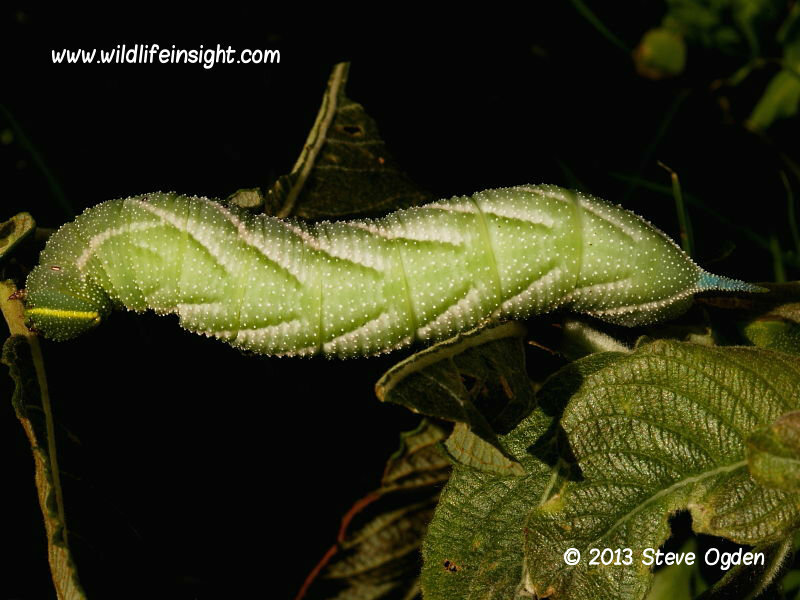 The following photographs were taken of caterpillars reared from eggs laid either by Eyed Hawkmoths attracted to light or from eggs found on the leaves of sallows in south west Cornwall in the British Isles. Eggs hatched within 10-14 days with the 3.5mm long caterpillars fed on locally collected sallow leaves. The 70mm long fully grown larvae pupated in a thin layer of soil. The period from eggs being laid to pupation was 45-50 days. Having overwintered as a pupa kept in cool conditions the adult moths emerged the following May. The fully grown caterpillars were between 70-75mm and variable shades of green flashed with white stripes angled towards the tail. 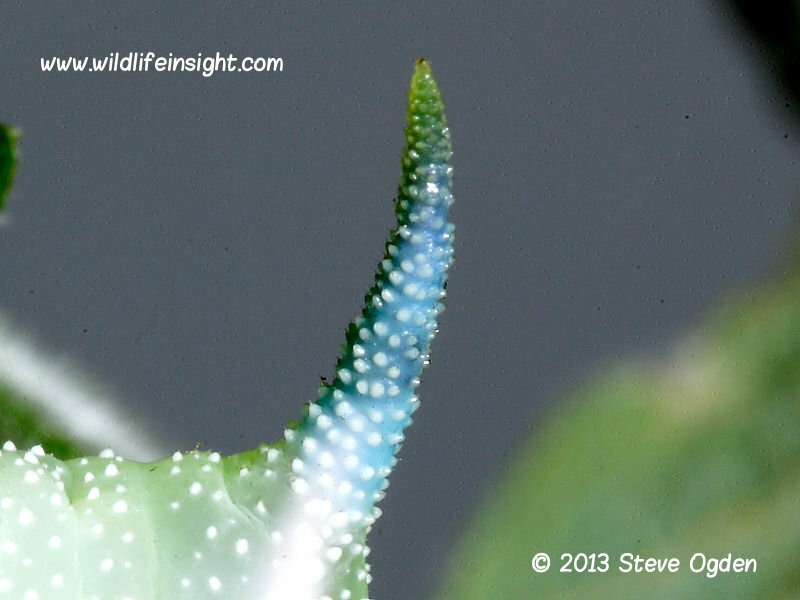 The tail horns on all larvae were blue and the spiracles large and outlined in red. The flat, triangular shaped head bordered by a well defined yellow line and the 3 pairs of dark red true legs were prominent features. 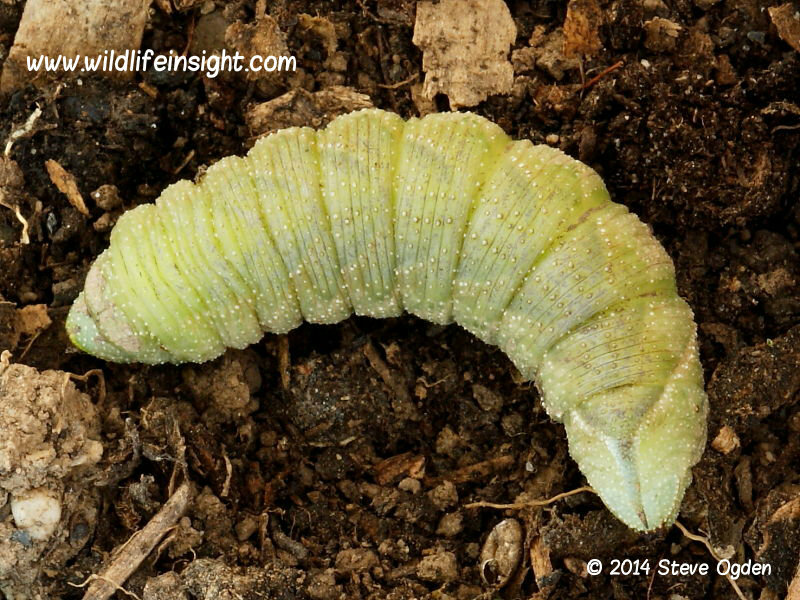 There appears to be far less extreme variation in colour in their larvae than recorded in many other Hawkmoth species. 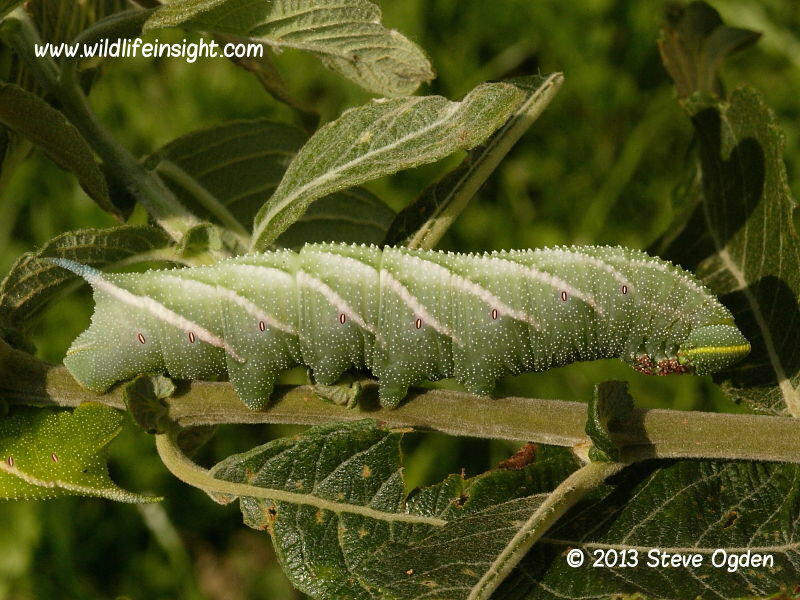 Similar Lime and Poplar Hawkmoth caterpillars can be seen in the caterpillar gallery and individual species pages. The Eyed Hawkmoth caterpillars were very easy to rear. One female attracted to light deposited eggs in small clusters of between 1-4 eggs on the larval food plant. In the field single eggs were also found in several locations on the upper side of willow and sallow leaves. 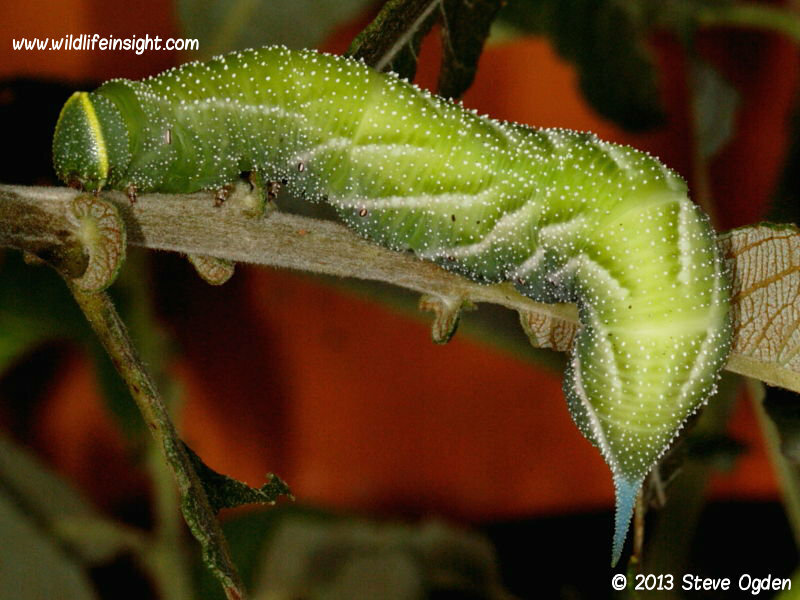 Caterpillars can also be found during the day or night by searching around leaves showing feeding signs. Apple trees in gardens are often worth checking. 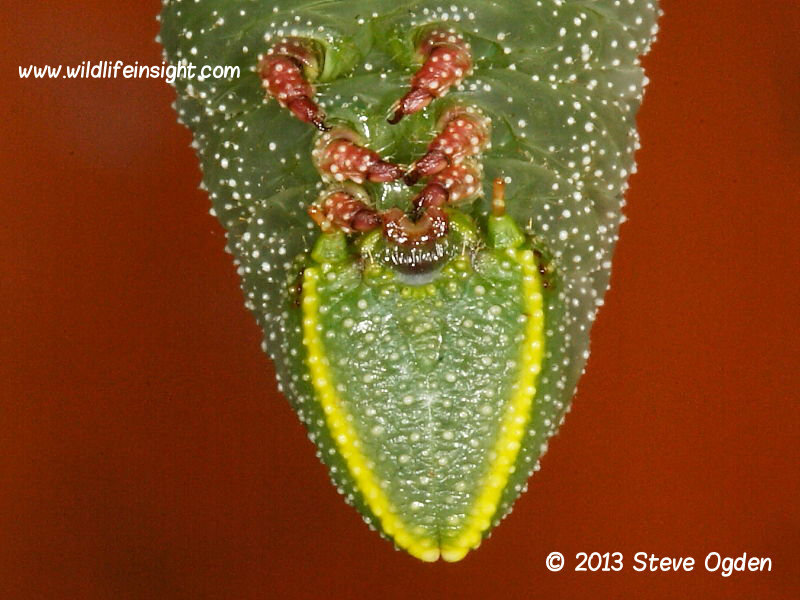 When fully grown the prepupating larvae were provided with a thin bed of soil to pupate in. The overwintering pupa were placed in a cool outhouse and brought inside in March. The newly emerged females will readily pair with males in captivity if not segregated or quickly released.